Outsiders tend to view Cambodia through a negative lens: The Khmer Rouge, poverty, and decades of neglect. But, in reality, this is overshadowed by Angkor Wat, the warm and hospitable Cambodians, and the VIP treatment towards tourists. Many go to Cambodia for a holiday just to see ancient temples and unfortunately neglect Phnom Penh. Phnom Penh, the capital of Cambodia, gets fewer tourists compared to Siem Reap for the famous Angkor Wat. The city has faced a turbulent recent past with the Khmer Rouge in the 1970’s. But Phnom Penh has recovered, which continues to impress foreign visitors. There are two types of attractions. Either you enjoy the Buddhist culture and marvel at the pagodas and hit the museums. Or you delve into the darker side of the capital’s history. A combination of both leaves visitors with a sense of awe and humbleness after witnessing the clash of the two different sides. The Royal Palace, the Kings official residence, is usually the first calling point. This large complex designed in the traditional Khmer architectural style dominates central Phnom Penh. Visitors can enter a number of rooms and see the Silver Pagoda. 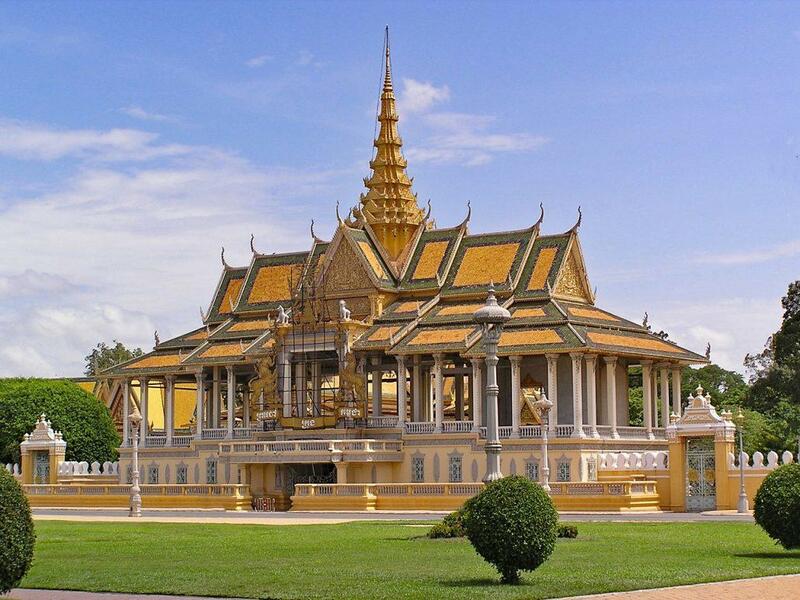 The National Museum of Cambodia is nearby with thousands of ancient relics from the rich history of the nation. Local handicrafts, souvenirs, and insect snacks are available in the art deco Central Market. Strolling along Sisowath Quay, the street next to the Mekong River, is a highlight for tourists during the day and night. Restaurants and bars line the streets offering an eclectic mixture of local and international cuisines. Boats take tourists on a river cruise or to the islands of Koh Dach or Koh Oknha Tei. Locals and vendors come out as the evening air cools. 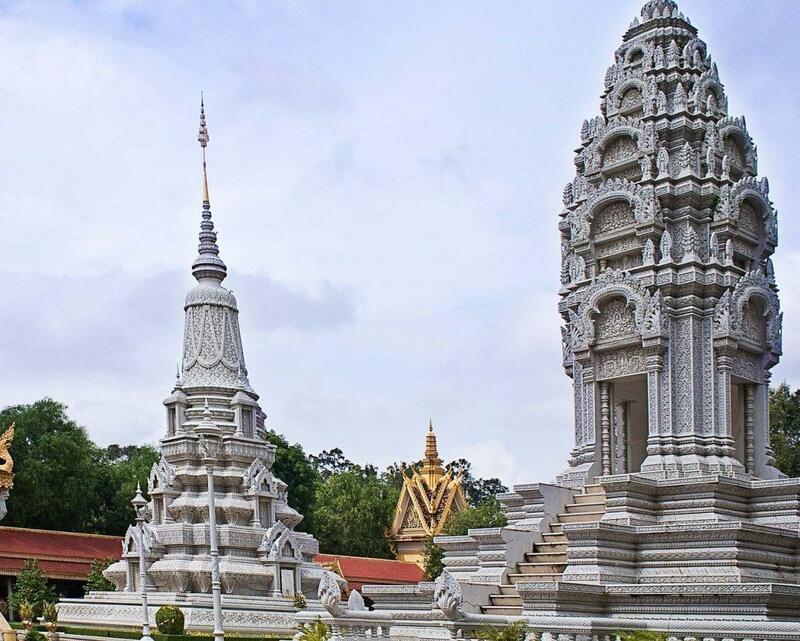 Heading a little further afield for a more spiritual experience, head to Wat Phnom. The 14th century pagoda is the tallest in the city reaching a height of 27 metres perched on the hill and surrounded by parks. Monkeys roam the area to the delight and annoyance of visitors. On the 17th April 1975, Khmer Rouge troops entered Phnom Penh and forced the 2.5 million residents out. The goal was to create a self-sustainable economy based on agriculture. Everyone had to leave or be shot. Families were split up in the chaos and confusion. Toul Sleng, a former high school, became the notorious S21 (Security Prison 21). Residents suspected of being dissidents and those with an education were imprisoned, tortured and murdered. Survivors were forced to march 15 kilometres to Choeung Ek or what is now known as the Killing Fields. Very few people survived and more than 9000 bodies were discovered in the mass graves. Tourists have the chance to visit both in Phnom Penh either independently or as part of a tour group. This is a very sombering and upsetting experience but something necessary to understand this city and Cambodia in general. Phnom Penh combines spirituality, local traditions, and the recent horrors of the Khmer Rouge making it a worthwhile stop on your Cambodian itinerary.